Let me break this cake down for you. 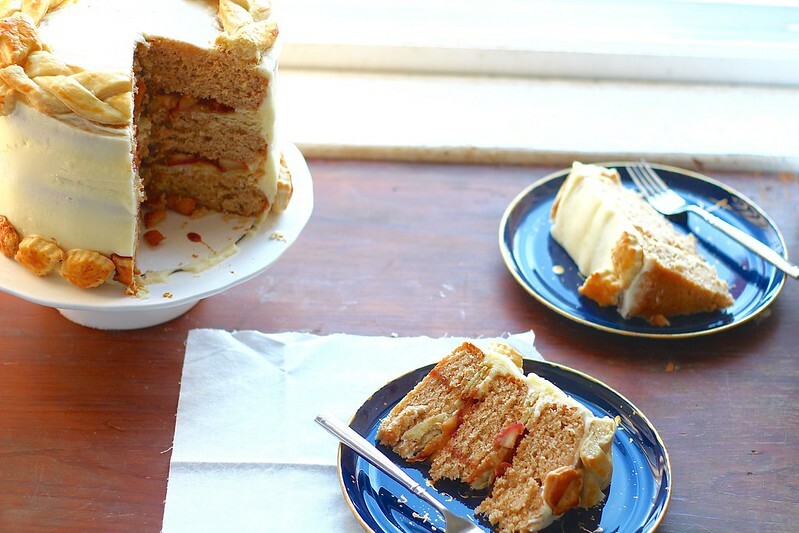 First, you make a delicious simple cake that has cinnamon and nutmeg in it. After baking and cooling the cake, you place a (homemade is best!) 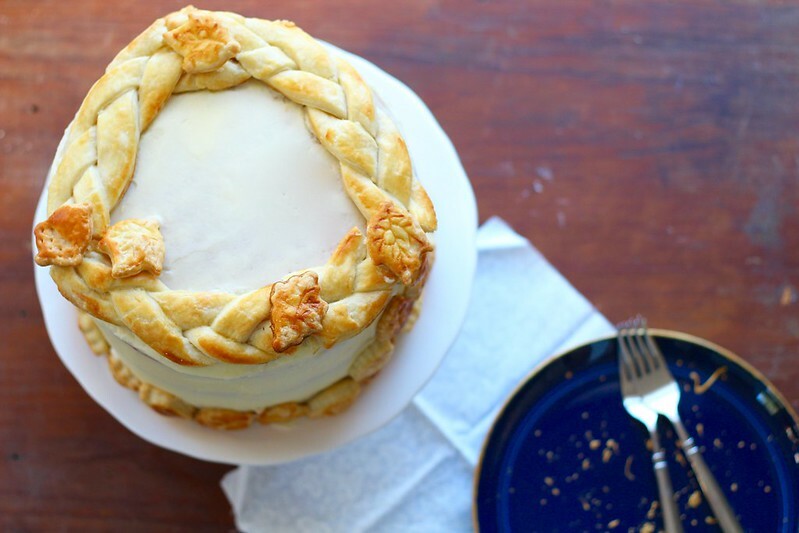 baked pie crust dish in between the layers of cake. 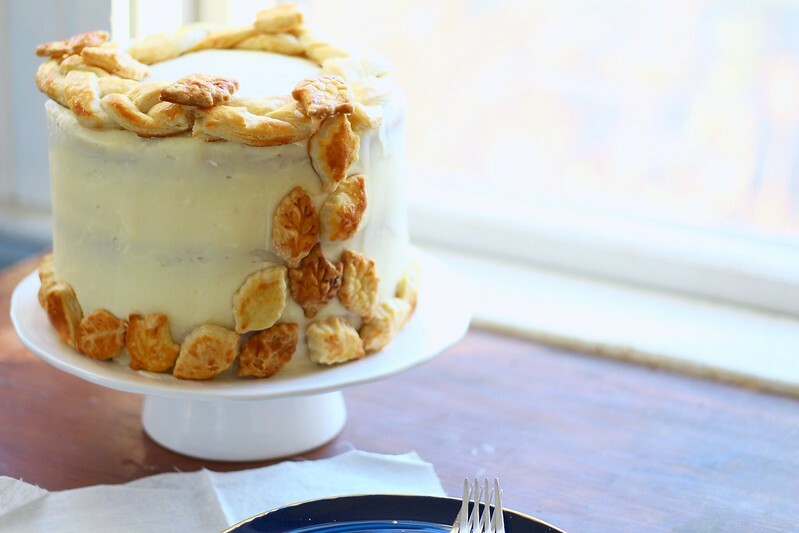 Delicious buttercream frosting is piped as a boarder around the crust, then the "well" is filled with apples that have been sautéd with honey, cinnamon and butter. 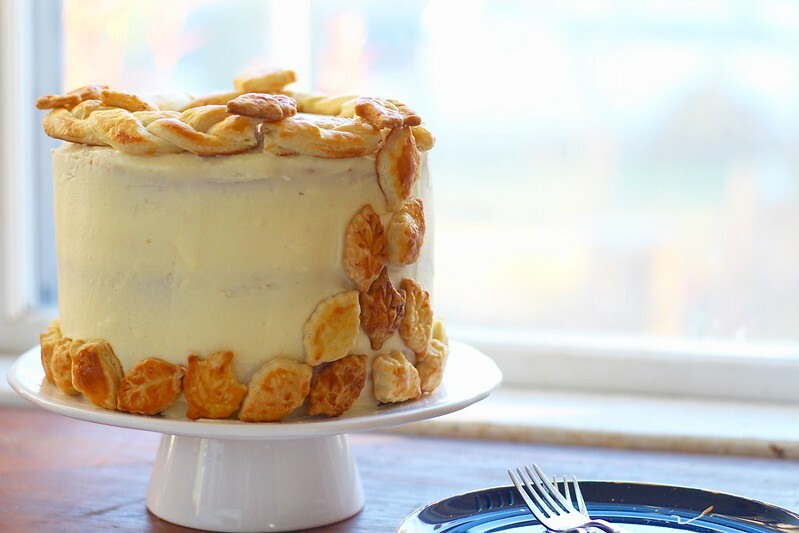 To finish, you frost the cake with the remaining buttercream, and decorate with baked pie crust pieces, if desired. So, give this cake a try, you won't be disappointed. Make this a day in advance, and just allow to com to room temperature before serving. One less thing to think about for Thanksgiving! This will be the dessert everyone remembers from Thanksgiving. Preheat oven to 350ºF. Grease and flour three 8″ cake pans then line the bottoms with parchment paper. Using a stand mixer fitted with the paddle attachment, beat butter until smooth. Add granulated sugar and brown sugar and beat on medium-high speed until pale and fluffy, about 2-3 minutes. Reduce speed and add eggs one at a time, beating well after each addition. Stir in the vanilla extract. With the mixer on low speed, alternate stirring in the flour and buttermilk, beginning and ending with the flour mixture, and mixing well between each addition. Once completely mixed, spread evenly into prepared pans. Smooth the top with a spatula. Place in the preheated oven and bake for about 30-40 minutes or until a toothpick inserted into the center comes out with just a few crumbs. Meanwhile, make the apple pie filling. In a large skillet, melt the butter over medium heat. Then stir in the remaining ingredients, stirring well to coat the apples. Cook, stirring often, until the apples are soft, about 10 minutes. Remove from heat and let cool completely. Next, make the pie crusts. Preheat the oven to 400ºF. Roll out two pieces to 9-inch rounds. Place on a cookie sheet lined with parchment paper or silpat. Combine remaining, scraps, and roll out. Cut out decorative shapes and make a braided crust that is 8 inches around, if desired. (If you don't want to make decorative pie crusts, just roll out two round pieces for layering cake and discard scraps.) Brush crusts with with egg wash. Bake in preheated oven for about 15 minutes, or until golden brown. Let cool completely before using. To make the frosting, place the butter in the bowl of an electric mixer fitted with the whisk attachment. Whip on medium-high speed until smooth, about 1 minute. Add the confectioners’ sugar to the bowl and mix on medium-low speed just until incorporated. Then, increase speed to medium-high and beat until smooth, about 1-2 minutes. Mix in the milk and vanilla extract on low speed just until incorporated. Increase the mixer speed and whip on high speed until light and fluffy, scraping down the bowl as needed, about 4-5 minutes. 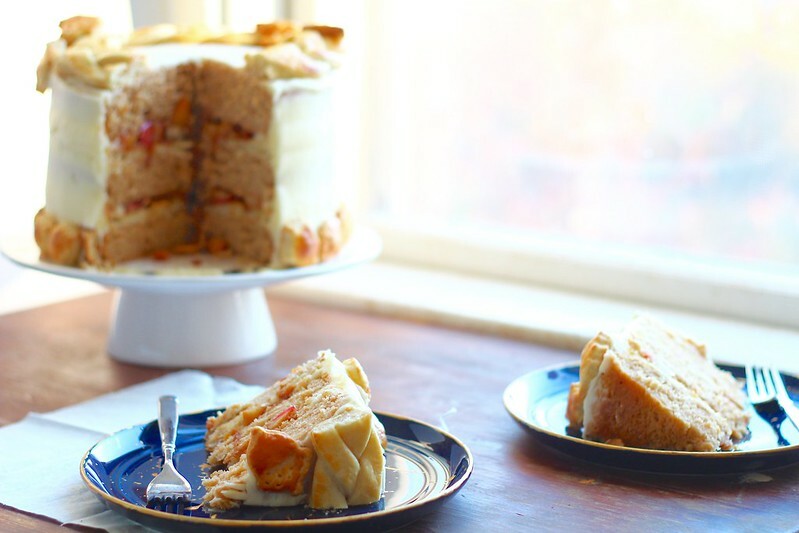 To assemble cake, place one layer of cake onto a cake stand or serving plate. Spread a thin layer of frosting on top and place a disc of pie crust on top. Using a large round tip, pipe a dam of frosting along the top of the pie crust to hold in the filling. Top with approximately 1/2 of apple pie filling and spread evenly. Repeat with next layer and place final cake layer on top. Frost the cake and smooth the sides and top. Apply pie crust cutouts to decorate as desired. Serve!